Kayung was an important village from at least the late eighteenth century, and it appears prominently on maps of that period. By the early 1880s, it had been abandoned in the consolidation of north coast villages to Masset that was encouraged by town chief Henry Wiah. 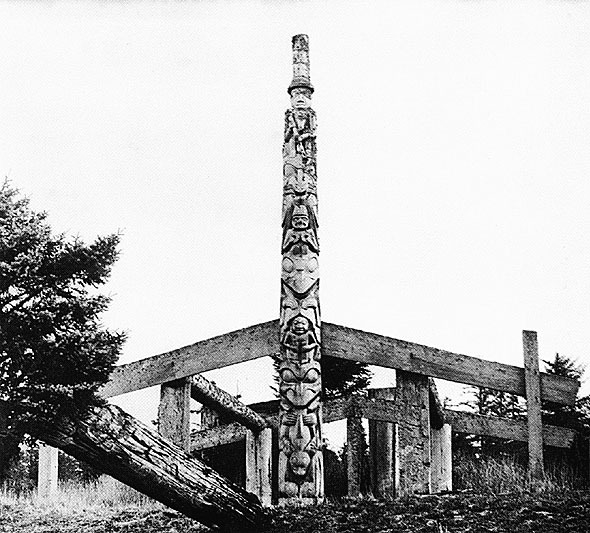 One fine pole stood in front of Chief Na'qadjut's House That Wears a Tall Dance Hat, so named in reference to the figure at the top of the pole, a chief wearing a hat with eight rings. The chief's tongue is joined to the tongue of a bearlike animal that he is holding. The depiction of joined tongues is rare on a totem pole, though it was a common feature on argillite carvings in the middle of the last century when this pole was probably created. The middle figure is a Whale with human arms holding its fins. The lowest figure is a Bear with a small Raven in its mouth. This pole was removed from Kayung at the turn of the century by Charles F. Newcombe for E. E. Ayers, a Chicago philanthropist who gave it to the Field Museum. 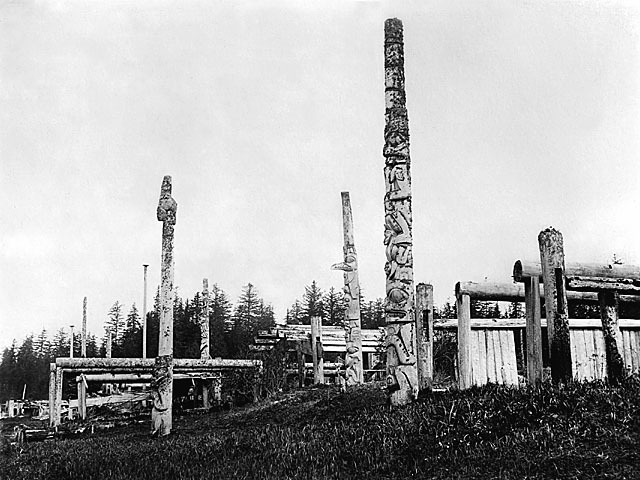 After passing through the hands several owners, the pole was purchased by the Canadian Museum of Civilization, which painstakingly restored it and erected it in front of the Haida house in the Grand Hall. A second exquisite pole tells the story of the lazy son-in-law. 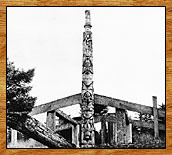 The son-in-law is depicted at the level of the gable board on the pole, on the back of a Sea Wolf that is eating a Killer Whale. His mother-in-law, who thinks she has a shaman's power to bring in whales (which in actuality her son-in-law has caught), is lodged above him between two Whales. The house chief holding his club sits at the top. When Richard Maynard arrived in 1884 to take the first photographs of Kayung, fourteen houses of the old style were still standing. The first five houses at the south end of the village belonged to the Eagles while the remainder all belonged to the Ravens. The remains of Goose House at Kayung village. The frontal pole, which illustrates the myth of the lazy son-in-law, is now in the British Museum.